Busy week here, but I wasn’t as great as I could have been at taking pictures of what I was doing, unfortunately. I made a couple of little fabric bins, one for thread and one for pin cushions and my bobbin box (tutorial here). 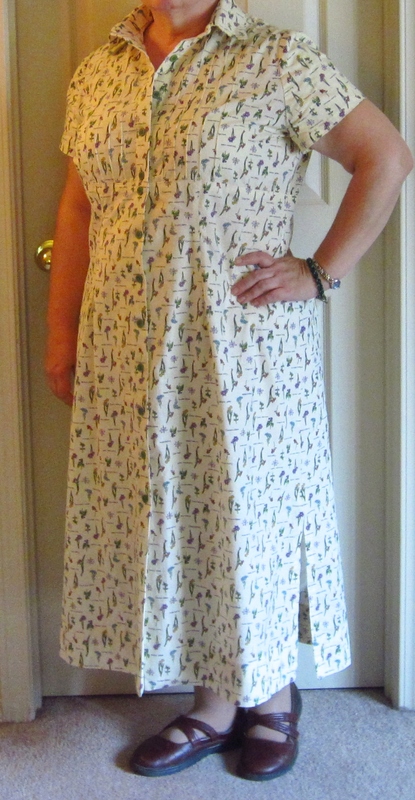 I used some of my Mary Engelbreit sewing-themed fabric from SCRAP Tri-Cities. These should have been quicker and easier than they were, but I had to piece my fabrics to get them big enough for the bins and then the heavyweight craft interfacing I used turned out to be a real pain to work with. (For example, no matter how I pressed it, I only managed to get it to fuse to my press cloth, never the actual fabric.) I think I would have been better off using a lighter interfacing and applying it to both the fabric and the lining. I’ll have to see if I have enough fabric for one more of these, as I could use another for all my purse hardware. They were a hassle to make, but I do love them and they’re such an improvement over the old shoe box I was using before. I took a walk with my mother this week to Zintel Canyon Park in Kennewick. Normally we take the paved trail, but this time it was under water, so we took the rougher trail. Much more photogenic. On Saturday, my partner and his buddies did a 200k bike ride, then everybody came back to our house for a potluck dinner. I’ve been to WAY too many potlucks with 12 plates of cookies and no main dishes, so to avoid that I made carnitas and some appetizers, and we asked folks to bring sides and desserts. This is quite the carnivorous crowd, though, so we wound up with ONE container of cookies, THREE meaty main dishes, AND a meaty appetizer. We had a great time, though, and all ate well. Pooh even decided at one point that he’s no longer shy around people; he strolled out to the living room and plopped down on his back for tummy rubs and general admiration (that all ended when somebody picked him up, though–NOPE, he wasn’t having that). Here’s a picture of the aftermath, though, and all the leftovers I’m going to be eating this week. I think the pork might make an appearance in chimichangas in a few days, and the leftover corn tortillas will have to go into chilaquiles at some point . . . .
I’ve also been working on my shark pencil / glasses case. The zipper could use some work . . . I think I’ll set this aside until tomorrow, then tackle it again. The instructions on the zipper installation are less than great. The plan for next week is to start work on my honey’s birthday present. I’ve been putting a plan together in my head for what I want to do and I’ve got my supplies and a month to make it. He’ll be in Oregon next weekend for another cycling event, so a lot of progress might be made then. I’m so glad that he has a hobby that keeps him moving and gets him together with all these great people. But I do sometimes wish he was super passionate about, say, knitting, and we could sit together and work on our projects rather than him being off on his bike for 12 hours at a time. Sigh. Anyway, have a great week everybody. Great idea! — Smooth execution! — Lovely result! This is the latter kind of project. I loved the idea of a Greenstyle Laurel dress in some sort of weighty knit; I mean, a dress like that with leggings underneath is maximum cozy for fall, right? But I haven’t sewn much with knits and don’t feel super-confident about doing so. Plus I haven’t made a Greenstyle pattern before, so I don’t how they fit, and reviews online are not very enlightening on that issue. So I decided to make a muslin using this tee shirt knit that my mother gave me. The whole “huge florid swirly cabbage rose print” thing is so very much my mother and so very much NOT me, but it’s a nice quality knit and I thought I might get some wear out of it. First big problem: not enough fabric. The pattern is vague on this, but says you may need up to 3 yards depending on what options you choose. I had 2 1/2, but probably needed 3 1/2. After MUCH angst, I decided to be cautious and cut a 2XL, even though my measurements would suggest an XL (and I chose the long torso option). I also added 3″ to the length of the skirt, a pretty unusual circumstance for stubby little me. Is that why I was so short on fabric? I don’t know, but I didn’t have enough to cut the front OR back bodice on the fold, I didn’t have enough for the full cowl, and I had to cut the sleeves crosswise. 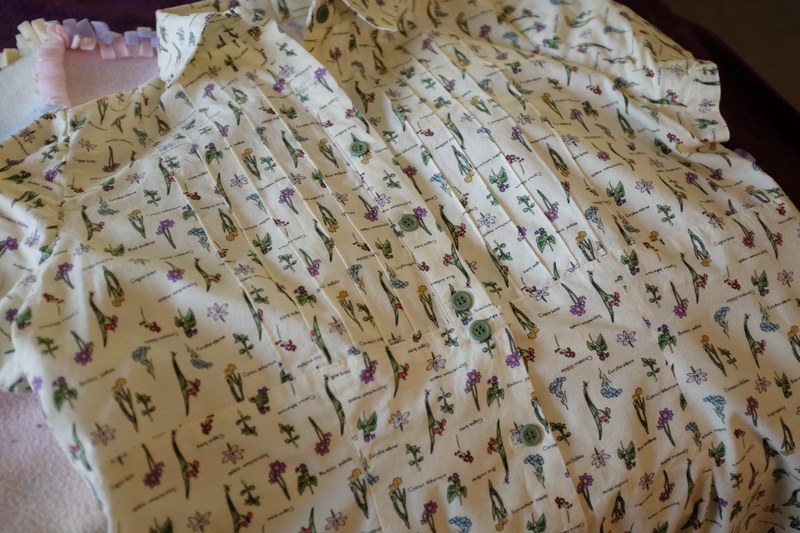 And then I discovered that the fabric has such a huge repeat–and I had so little left of it–that pattern matching of the bodice was not anywhere near possible. OH JOY. There were several points at which the only thing that kept me working on this project was the thought this was a muslin, and this was the first of those points. So I took a few days’ break from the dress, then came back and started sewing, using the sewing order from the CSC review of the pattern (LOVE inserting sleeves before sewing side seams!) I hadn’t realized I was out of ballpoint needles, though, so I had all kinds of problems with skipped stitches, broken thread, thread nests, you name it. Of course I should have stopped right there and gone out and bought a ballpoint needle, and of course I did not. Sigh. But I finally got it all together and tried it on. I thought I was going to have to hem this by hand, but I finally got lucky–it felt way overdue!–and found a “reinforced straight stitch” option on my sewing machine that actually worked on the knit without any drama. Then, just because I like the contrast of leggings with lace, I slip stitched some lace to the hem. I wound up using this mauve-y thread because my sewing machine decided it hated my black thread. And then, because I wanted to do SOMETHING to that front bodice seam to make it look more intentional and less half-assed, I added some buttons. Boy, they’re hard to see here, but all three are on there. So, final verdict on the dress: feels SO SUPER LOVELY OMG WHERE HAVE YOU BEEN ALL MY LIFE to wear, but oy those cabbage roses. I do have an off-white fleece cardigan I can wear over it to cover some of them up, though, so that may help. I have some days when I haven’t slept well and every joint aches, and all I want is to be comfortable and not have to think–this is the dress for those days. Sizing is right on, though I might raise the neckline just a bit next time and make the pockets out of lining fabric to reduce bulk. I’m also thinking about a good-sized piece of purple knit fabric that I saw at SCRAP last week, and about how I need to make another one of these dresses immediately. I am feeling so very ready for fall. 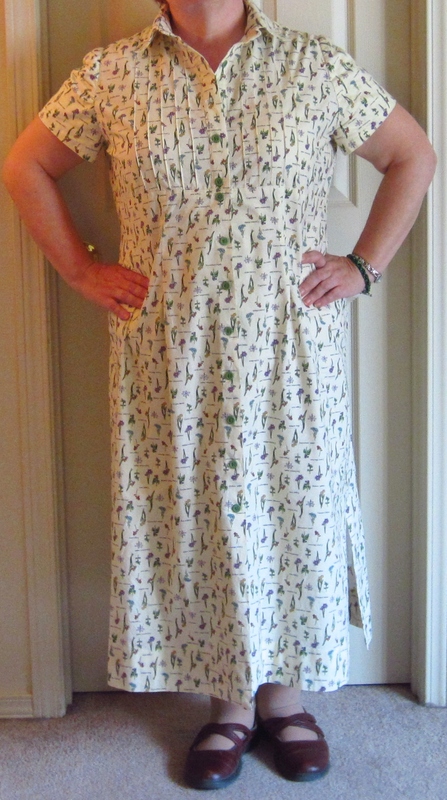 ETA: Forgot to mention in the post, but this is my entry for Fabulous Fall week at the Sew Long Summer Sew-Along. 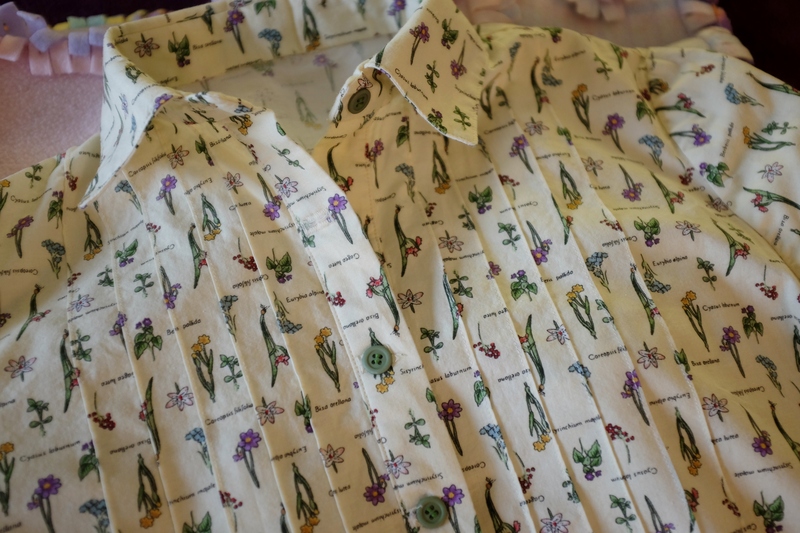 Labor Day is the unofficial end of summer in the U.S., so I thought I should blog about my last two summer blouses then, just to sort of tidy up and end the season neatly. But of course these things aren’t neat. It was hot on Labor Day weekend and felt very much like summer was still underway. It’s been cooler in the mornings lately, but afternoon temps have still been near 90F. But fall arrived this week. Sunday’s high temp was 96, I think, but Monday’s was 71 and accompanied by a gray sky. It’s been cool all week, and I’m starting to see people in fall clothing. So time to wrap up summer and blog about the other two hot-weather blouses I made (and enjoyed) this summer. 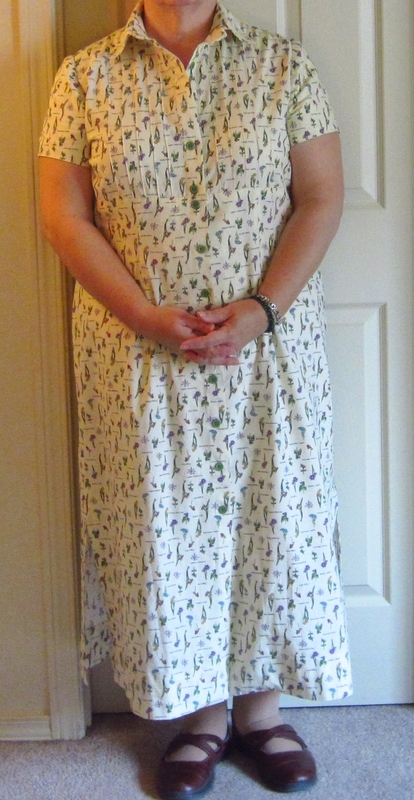 First, Butterick 5610, which I chose because it was the only pattern I had that would enable me to use my single yard of this embroidered cotton. I love this fabric, but it was pricey ($14 a yard, I think) and the end of the bolt said it was 50+ inches wide, so I just got a yard of it and figured that should be enough. Problem is, it has a super-wide unembroidered edge, so the actual usable part of the fabric is only about 45″–not much fabric to cover a plus-size bod. So I combined it with a plain white cotton from the stash and bound the sleeves with scraps of the embroidered fabric to help tie it together. Couple of warnings about this pattern, if you should decide to make it. First, the pleating in the front is weird and confusing and the instructions aren’t much help. You make some pleats like normal–okay, I’m with you so far–but then you’re supposed to make an “inner pleat”–what? I never did figure that out–then a big pleat essentially pleating the pleats. I had no idea which markings to match up for the last one, so I puzzled over it and turned it over and over, and suddenly I saw it. No idea how I did it, but it looks like the pleating on the envelope, so I’m calling it a win. Second, if you hate hand sewing, this is not your pattern. The whole front and back facing–which extends into the sleeves–AND the sleeve hems are slip-stitched down, which takes some time. Third, you need fabric with a lot of drape for this pattern. As you can see from all the creases in my pictures, my fabrics really weren’t right for it. Besides all the creasing, the lack of drape also makes me look a little bit pregnant, since I carry my weight in the abdomen. Something like challis would’ve looked much better in this style. You know what, though? I really like this blouse and I wear it a lot. It’s cool and comfy and I still love that embroidered cotton. 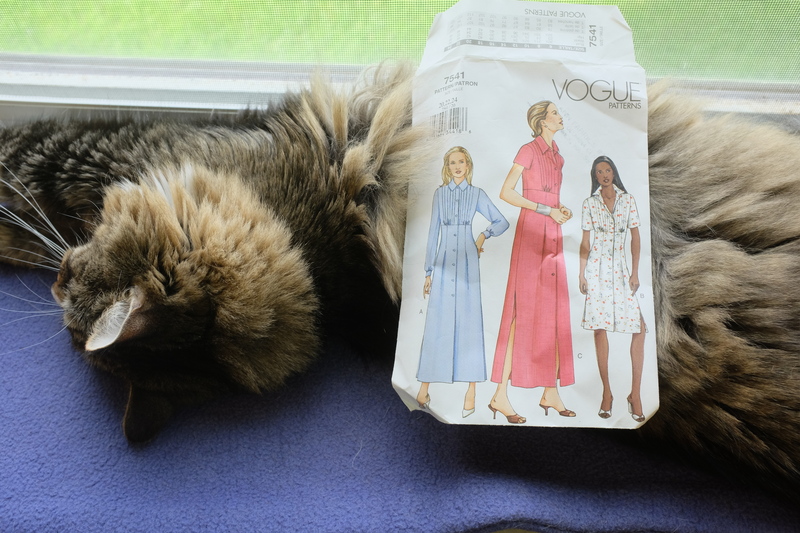 Okay, on to Butterick 6057, another pattern meant for chiffon or some other light, drapey fabric. What I had in mind, though, was a simple woven cotton tee shirt, since I’ve been enjoying wearing my other cotton tops so much. I evened up the high-low hem on this and included all the cute details from the different views on the pattern envelope. You can barely see the pocket in this ladybug print, so I sewed a button on it to make it a little more visible. And I was determined not to have to iron this, so I sewed down the sleeve cuffs to make them stay put. There are buttons down the back, another fun detail I liked. I used BIG buttons to emphasize them. Please note, buttonhole haters: this thing took something like 11 buttons and I didn’t have to sew a single buttonhole. The “band” on the back is actually just a pleat that’s sewn down. This would actually be a great pattern for a sewing n00b, as long as you use an easy-to-handle fabric like cotton. The neckline on this blouse is a little bit wide for my taste, but–let’s be honest here–I was just too damn lazy to check it beforehand, even though this is a problem I often have. I was going for quick and easy on this, DAMMIT. Both of these have been really useful (and fun!) additions to my summer wardrobe, the kind of tops you look forward to putting on and enjoy wearing all day. Now on to fall sewing and that Laurel dress that’s all cut out and ready to go. ETA: I have linked this to Finish It Up Friday over at Crazy Mom Quilts and Whoop Whoop Friday at Confessions of a Fabric Addict.